Two props with hard hats | can i just finish my waffle? 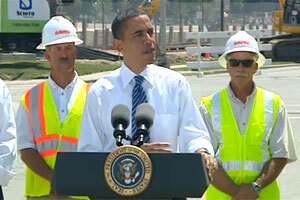 The prez in Ohio again, wasting fuel, babbling on. Two guys in hard hats staged in the background. Pathetic. The rest of the crew was laid off for the day for his appearance. They’re not real happy. What’s the matter? Are they afraid somebody might blurt out the truth? Obama not JAEL after all epic FAEL Obama’s Crypt-o-nite. What a loser! America has his “number” now; however, the “one” seems to be in denial mode. I think he knows he is in over his head, and I suspect someone is going to exit the White House…if I had to guess it should be Axelrod. I really don’t think that Rahm Emanuel is the one giving him all the bad advice. Everything is political to Axelrod. We should have a poll who in the Obama’s advisory circle is going to be ejected first? I don’t know if it will be Axelrod but it should be Axelrod. This comes down to poor advice and poor Public Relations “handling” of the disaster. Bill O’Reilly is on right now tearing up the Coast Guard for stopping the oil spill clean up to check for life jackets. The word of the day “dopeyness” LOL! Ree, yes, I have been watching O’Reilly just now. That Coast Guard situation is ridiculous. I just have a bad feeling about all of this. I know I probably sound radical, but this is seeming more and more like it was staged, and I hate thinking it, but I’m starting to “go there.” If O is sitting there letting this happen, just so he can get his agenda through, then I hope he gets everything he deserves and then some. Where is Rahm Emmanuel? Is he still in Israel? I was thinking that he would be fired. I hadn’t thought of Axelrod being “axed” but maybe you are right. It will be interesting to see what unfolds. That money from BP should be handled by the governors, not the federal government. And BTW, can you believe the federal government is suing Arizona because they are upholding a federal law! Yes, indeedy, everything is upside down. That law suit against Arizona is a vain attempt to change the topic in the news cycle. If people get distracted they will forget what’s happening in the Gulf? I know it sounds stupid but the people who are trying to manipulate the public think we all are stupid. It’s not going to work and I would be surprised to see this law suit happen before the mid term elections as if the Democrats would chance loosing even more support. There are plenty of Independents and Democrats that don’t want Amnesty…imagine everyone (voters) who knows someone who is out of work unemployed, and the Democrats pitch open borders to them, that’s the only thing this law suit can result in open borders no enforcement…..It’s a non starter. Nope they are feeling the heat from that oil spill and want us to look at something else besides that endless spill cam and dead wildlife. It’s not gonna happen the MSM isn’t going to stop covering the spill. I liked Beck on O’Reilly tonight. Made me laugh – Charlie Rose, anything but soccer. lol. ##!## oil spill! These people are downright evil. I’ll get back to Beck on the show and check it out. I heard someone say today that “crap” runs downhill..so true. BTW…have you heard any of those Alvin Green interviews. I heard Levin interview him this week and I was flabergasted. You may have a post on it…I’ll check…Laura I. interviewed him this morning. He was a tiny bit better…gosh, and he got votes and won…yep, everything is upside down..
Ginger, I’ve seen that movie and read the book, but I’m not remembering which one it is. lol. Is that the one with the woman who managed to get her husband to kill I think his father? I heard the Levin interview of Greene. The funny thing to me is that they were trying to get him disqualified, the democrats were. I thought, well, you would think he would be an ideal candidate for them, minority, college graduate, military — just because he needs a note to remember who he’s running against, hey, that shouldn’t be a problem. Can you imagine what a stir there would be in somebody in S. C. disqualified him from being on the ballot. God, we would never have heard the end of that raaaacist cry. Anyway, I guess they finally decided to certify him. Pretty funny. Well, the movie’s not over yet, and I don’t remember all of the book, but I thought she had killed the parents in the basement but her husband was accused. I might be confused , ha.. and then she poisoned his grandparents and only went to jail 7 years for that and NOW she’s CARETAKER for a man who was injured in an auto wreck.. movie not over yet.. lol..her name is Pat..does that ring a bell? I don’t know what is going on with that Alvin Green guy..that is all very strange..Lord, he could actually beat Demint if that is the mentality of the majority of voters.. very scary.. I’m thinkin if he had run in 2008 for the Presidential race instead of obama, he probably would have won, since nothing seemed to matter but that a black man won and therefore it was historic.. oh, we are paying the price for that stupidity now. Overall, 41% of voters say they at least somewhat approve of the president’s performance. That’s the lowest level of approval yet recorded for this president. Fifty-eight percent (58%) now disapprove. Yes, that’s the movie I was thinking about. Pat was her name. I’ve seen it. I’m listening to Jerry but I think I’ve already heard this, so it must be recorded. I don’t know if he is still on or not. Have you heard anything? I’m listening to Jerry too, but just turned it on. He is still on I believe..they are still talking about that newsletter he is going to put out. I’ve been listening along most of this week, however, I haven’t caught all of every show. Ayers and Dorn and those weather underground days really amazes me. I was reading Michelle Malkin’s blog on this same topic the hard hats as props…it turns out they weren’t being paid…unpaid day to stand as props for the stimulus that supposedly was going to create paid jobs….. They need to FIRE their Public Relations Department head of head of Communications? Whoever is handling Obama’s public relations. They keep making him look phony and stupid. Ree, I also saw where it cost at least $500,000 for the fuel to fly Air Force One up there for a ten minute speech. Do they not have some microphones in Washington, D. C.? If the Republican take over the house and senate this November, there is going to be so many investigations opened into the Democrats, who have been bending if not breaking U.S. Laws. I think the American Public is up for some investigations, I know I am. The Dems will claim this is a waste of tax payer money – which will again be ironic considering who will be making that claim 😉 We just know Nancy Pelosi is going to be all kinds of concerned at the cost to us – when they take a look at her crooked deals. Alvin Green makes me think of the Eddie Murphy movie “A Distinguished Gentleman” Murphy gets elected solely on name recognition. Someone said that in S.C. that “Alvin” is a common name for African Americans…I don’t know it’s a pretty common name….but a primary voter did say his name remind her of “Al Green” R&B singer. It’s a sad state of affairs this is how some people decide who to vote for. Take a look at the comments to this clip pretty telling huh. I guess Alvin Green figured it worked for Obama why not me. American Politics is full of Con Jobs. Who voted in the guy who believed if you add more troops to Guam, that the island would tip over? Many are approaching public service as a scam. Michelle has an even better picture showing the heavy equipment in the background, positioned in the exact center behind the podium. lol. Yes We Can – We Are The People We Have Been Waiting For – I Like Pie LMAO! Oh, that clip is funny, Ree. I haven’t seen that movie. How telling! Ree, maybe he does have poor PR advisors, but common sense should tell him that he’s really way off base. I think that a lot of the problem is he is so detached, and can’t relate. I don’t think he is stupid but I do think he is emotionally off balance and a phony. Drudge has headline: Hayward goes sailing, Obama and Biden golfing. Are these people just laughing at us behind our backs? They are rubbing the nation’s face in oil and going jolly, jolly. They won’t be that happy after November, let them yuk it up. Fiddling while Rome burns “small people indeed” these clowns are so low rent. He is GREEN, he has to dance with the ones that brought him. Who ever heard of a rise to power so fast and by someone with so little experience. Only 18 months in the U.S. Senate. He is the face turned out toward us, but if I had to guess folks back in Chicago are calling the shots…they did him a big favor the way they see it GRIN. It looks like Alvin is just following a proven blue print for rising from obscurity to hold a high office in the United States Congress. Imagine what they know, and have on him…think Chicago. I bet Blago gets off, and he should, he isn’t the worst of this bunch. After next November it’s going to be a whole new ball game, and it could actually free Obama up. Ree, I just pray we have elections..really, I am starting to get nervous about it. I don’t put anything past these people who are behind Obama….Chicago, the globalists -Tri-Lateral Commission, Bilderberg, Committee on Foreign Relations, whomever, –someone is definitely setting up events in my opinion…and look for a war with Iran soon…a nice big distraction….hope I’m wrong. I hope we have normal elections as usual, but I’m worried. what goes round comes . have you seen the Obama emblem with the oil dribbling down it…check out the home page of tammybruce.com and scroll down a little. sorry…couldn’t get it two work.. check out tammy’s page. I’ve been wondering about Mel, too. She may be on vacation. I saw that O emblem with oil. Pretty telling. Have you read LC today? And MsM, I haven’t seen her in weeks. I’ll send an email to mel or check out her facebook. MsM.. where are you?…we need you here…mel, too..